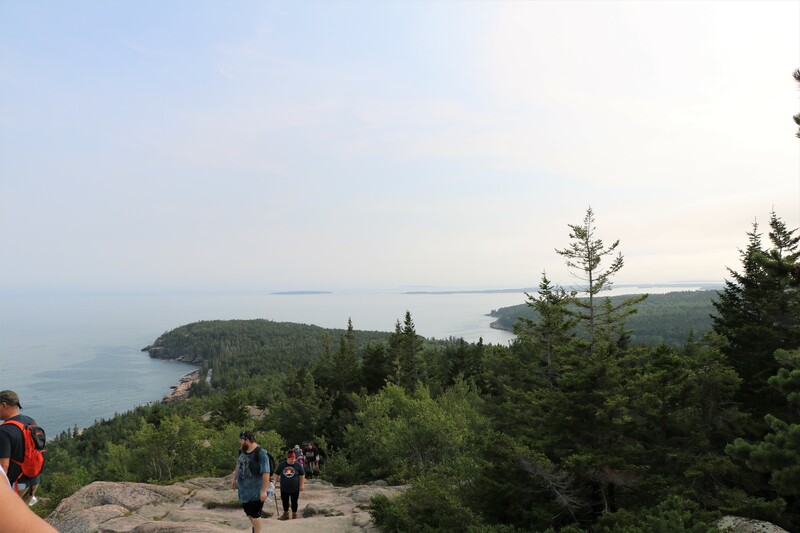 Our time in Maine was actually spent in three different segments: it was broken up by going to Nova Scotia and Prince Edward Island as well as a plane ride home for a family wedding. Regardless, we fell in love with its charm no matter which section of our travels we were in. 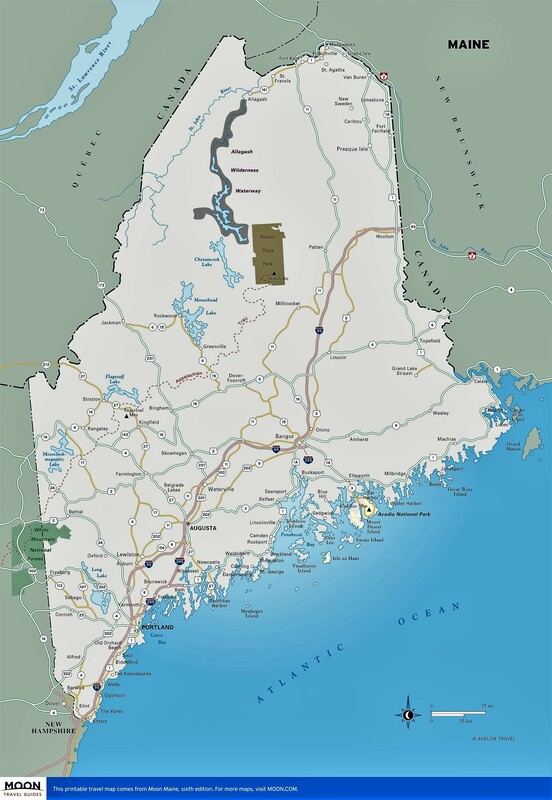 Initially we came into Maine via driving straight through Vermont and New Hampshire after visiting Upstate New York. Our main objective on that leg was to enter Canada through the border crossing at Houlton, but first we spent the weekend in Bangor. We stayed at the Pumpkin Patch RV Resort which was a nice park- the sites were adequate and it looked well maintained. The downtown area of Bangor, Maine had hip eateries and coffee shops and we saw plenty of young backpackers strolling around. It was right near one of the city’s best attractions, the walkway along the Penobscot River. 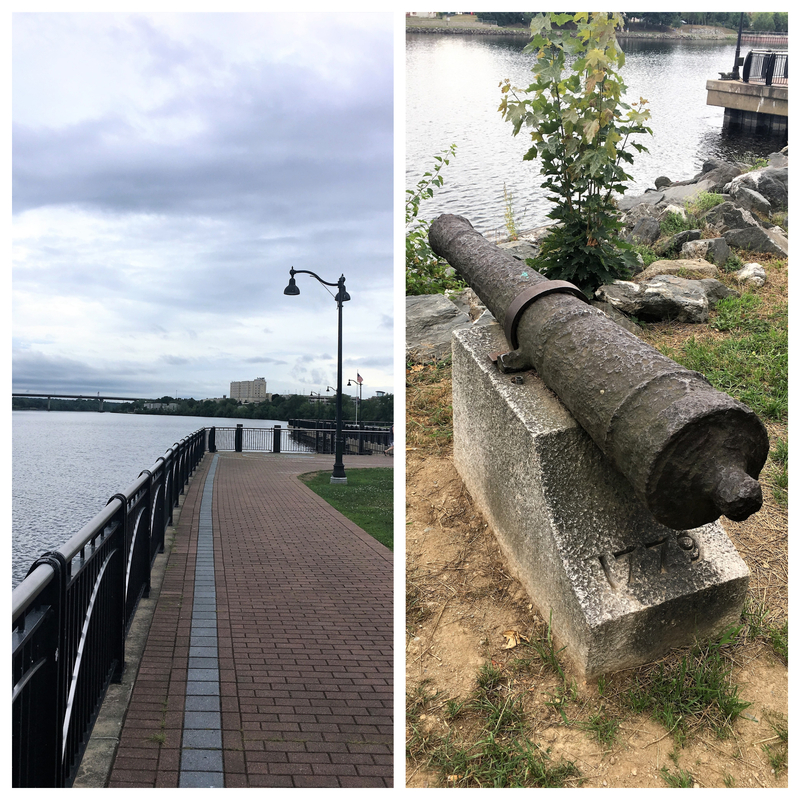 Although the day was rainy, we enjoyed Penobscot River Walkway The canon shown above apparently was found in the river and dates back to the Revolutionary War. There was a parking area for food trucks and several restaurants. I had my first Maine lobster roll at the Sea Dog Brewing Co. and honestly, it was probably the best one of the whole trip. Trip Review rates this restaurant with four out of five stars, so perhaps the lobster roll is the best thing to get there. Another great thing the city has going for it is the Cole Land Transportation Museum The photo of the museum building above was not altered to be black and white; it’s just that the weather that day was bleak. 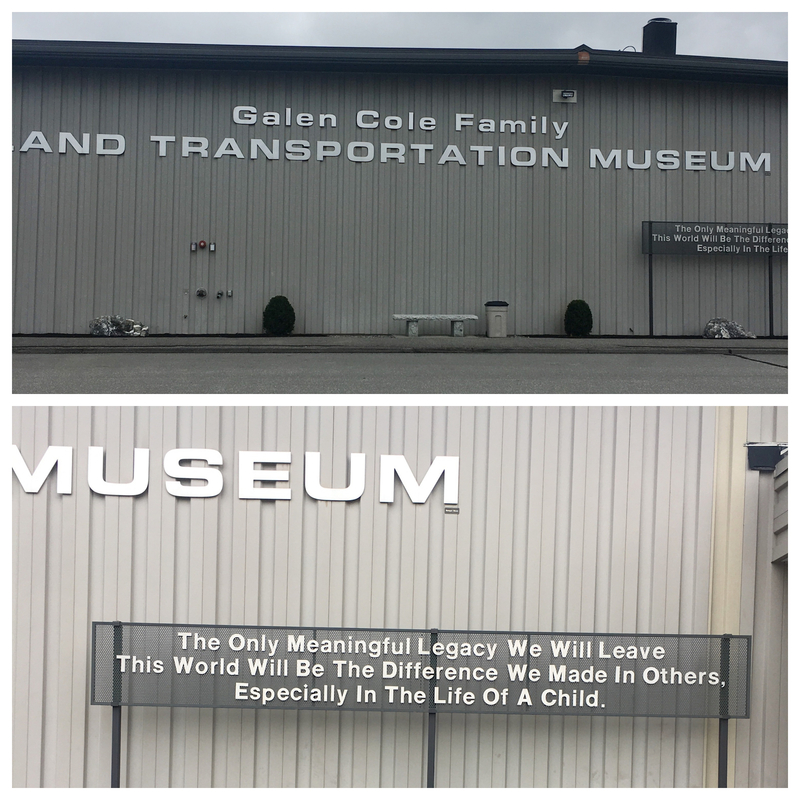 The story of the museum warmed my heart though. It was founded by Galen Cole, a WWII veteran and son of Alli Cole whose determination and grit grew Cole Transportation into a huge business. After a near death experience in the war, Galen vowed to somehow make a difference in his life. The museum has a foundation that supports youth and veterans. 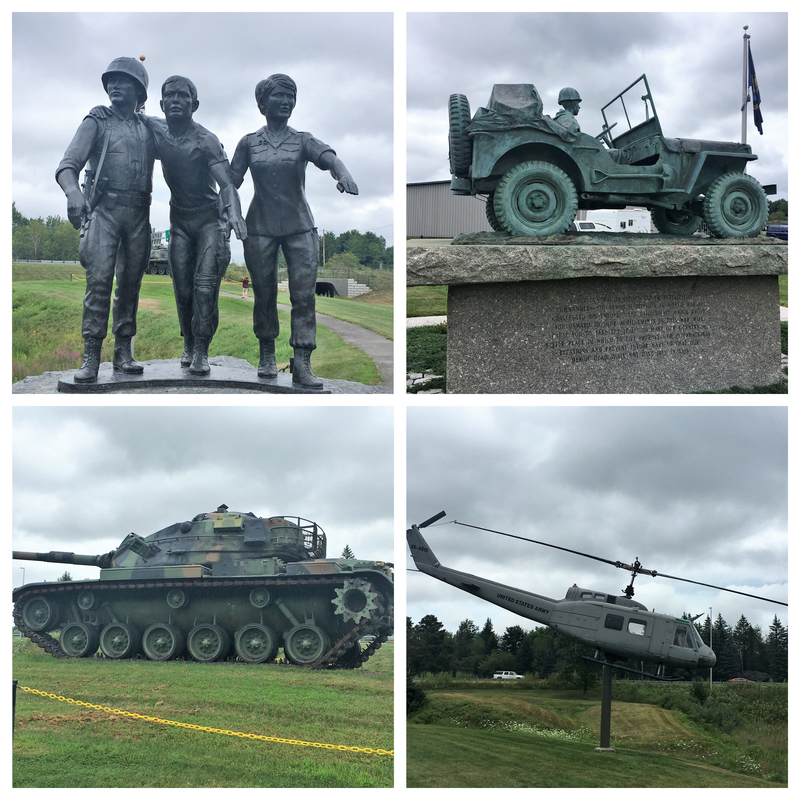 Outside of the museum there are several vehicles and statues that honor the military. Inside the museum there was all kinds of plows, trucks and even campers. 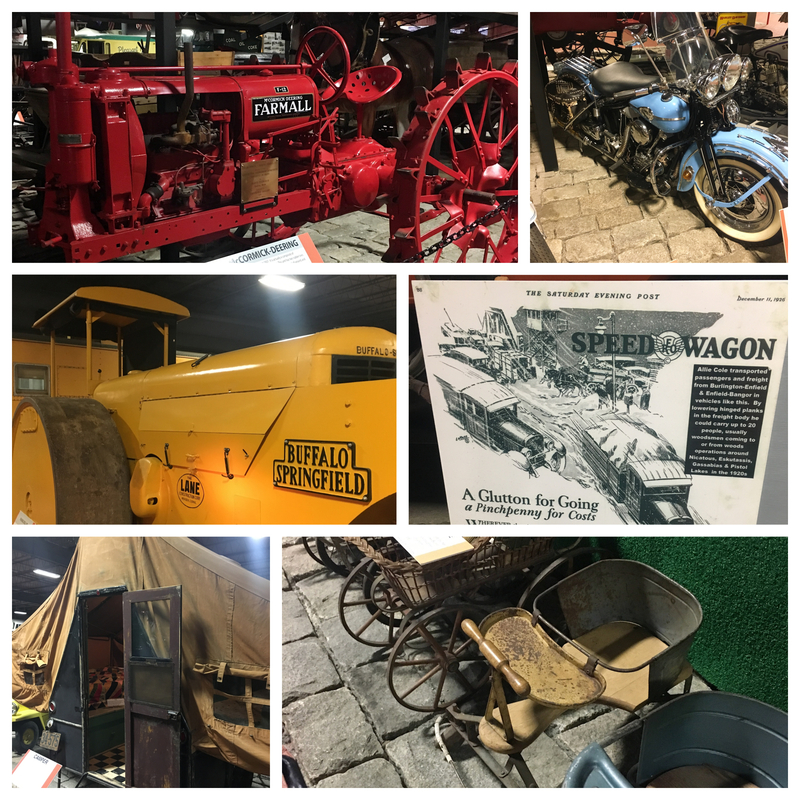 I was intrigued with the names of some manufacturers like Buffalo Springfield and REO Speed Wagon – is that where those rock groups got there names? From Bangor we went into Canada for about ten days and then entered again at Houlton, Maine. This time we stayed at the Timberland Acres RV Park in Ellsworth or Trenton – we saw the address given both ways. 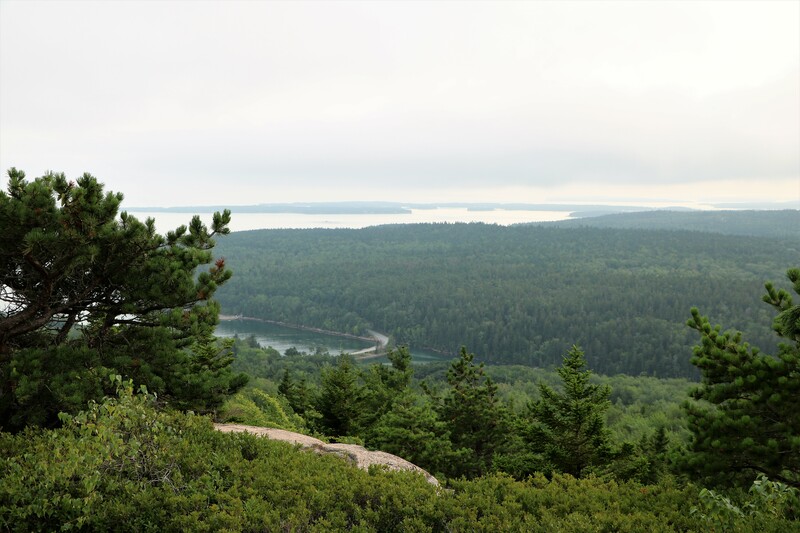 It was about a half hour drive to Acadia National Park and the site we stayed on was a big, spacious pull-through. 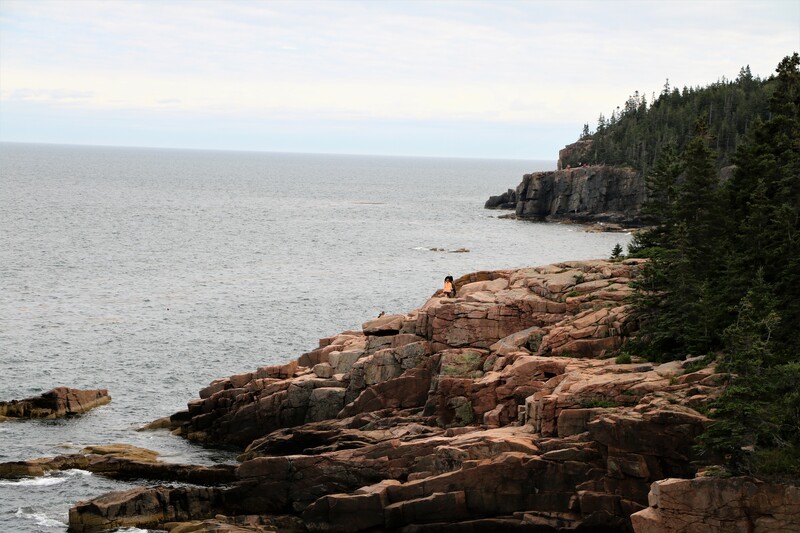 Acadia National Park was everything I hoped it would be. It takes about an hour and a half to drive around Park Loop Road . 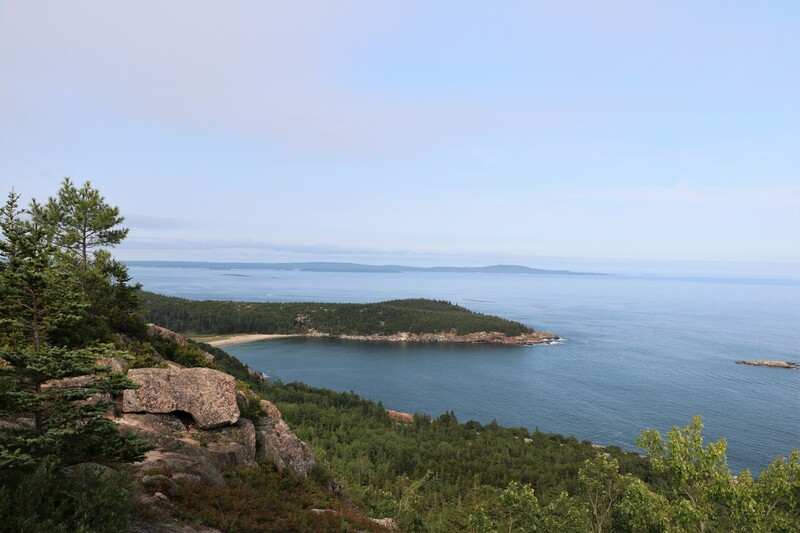 There are plenty of places to park and get out to take photos like this view of Frenchman Bay above. 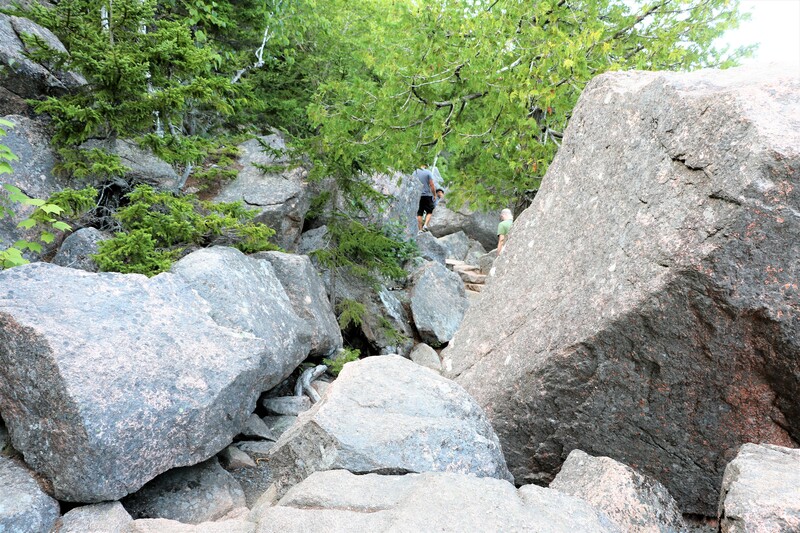 The rocks that line it are known as Rockefeller’s Teeth. 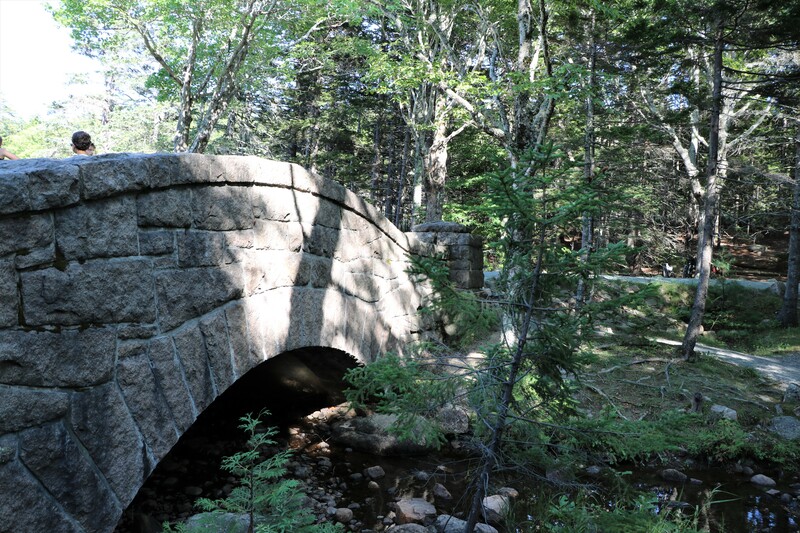 John D. Rockefeller loved the area and donated lots of money to build roads and bridges through out the park. 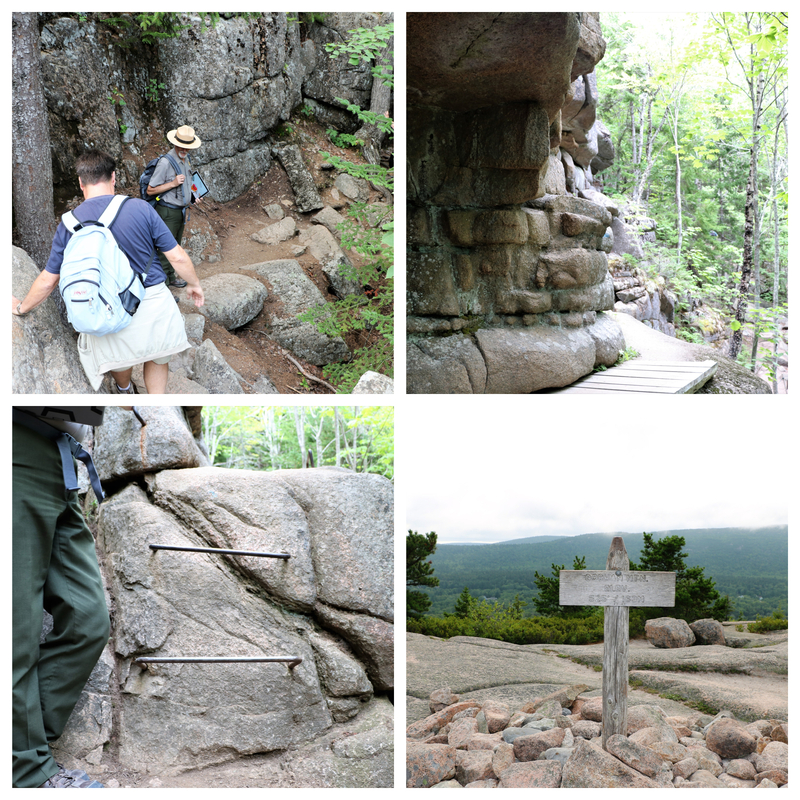 We took a ranger guided walk on the Gorham Mountain Trail . We were really glad to have someone lead the way because the hike is mostly over rock and it would have been hard to know where the trail was otherwise. For us, the trail was on the challenging side but do-able. The views were worth it all! The Ocean Path trail starts at Sand Beach . It’s really just a stroll along the Park Loop Road that hugs the ocean side of the park. One great thing about this hike is that there were opportunities to leave the trail and go out on the rocks. 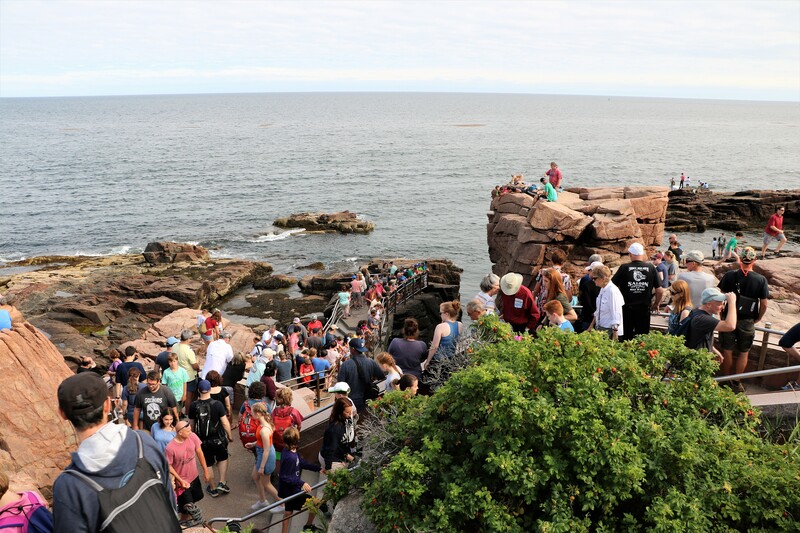 Along the Ocean Path trail is Thunder Hole . There is a narrow cave under the ledge that people in the photo are sitting on top of. About two hours before high tide, it sounds like thunder if a big wave comes along and air is forced out of the ledge. We waited a while but didn’t hear it. 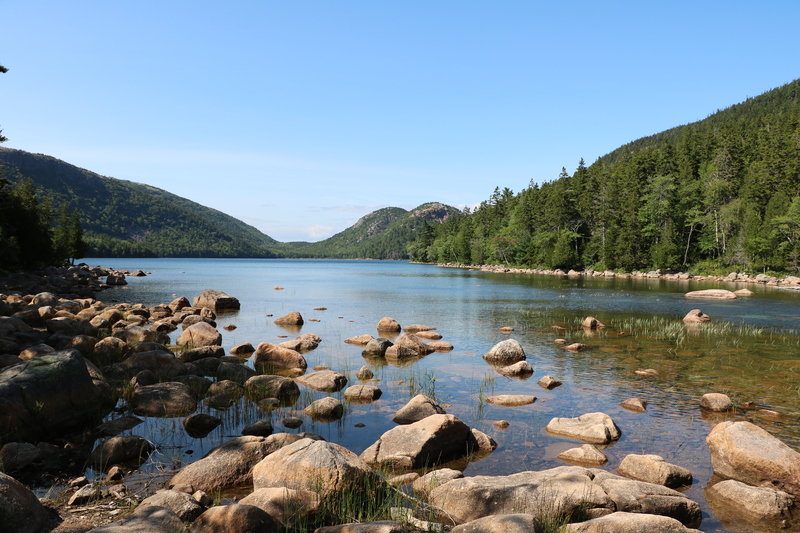 The Jordan Pond House is a famous stop for popovers and tea and is the start of Jordan Pond Path . We didn’t partake of those treats but instead saved our appetite for lobster. 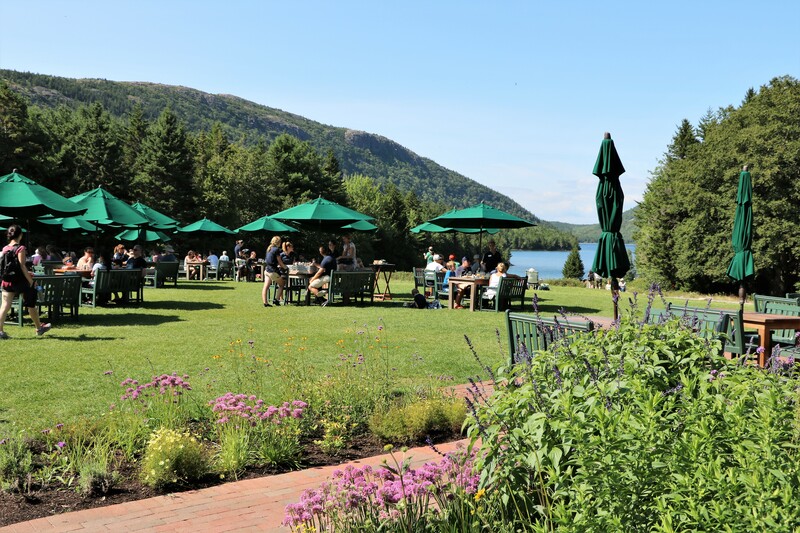 There are little seasonal restaurants in the Bar Harbor area outside the park that consist of large pots of boiling water heated by propane and picnic tables. They are inexpensive and the lobster, corn on the cob, and mussels served are delicious. Our favorite was Rose Eden Lobster. 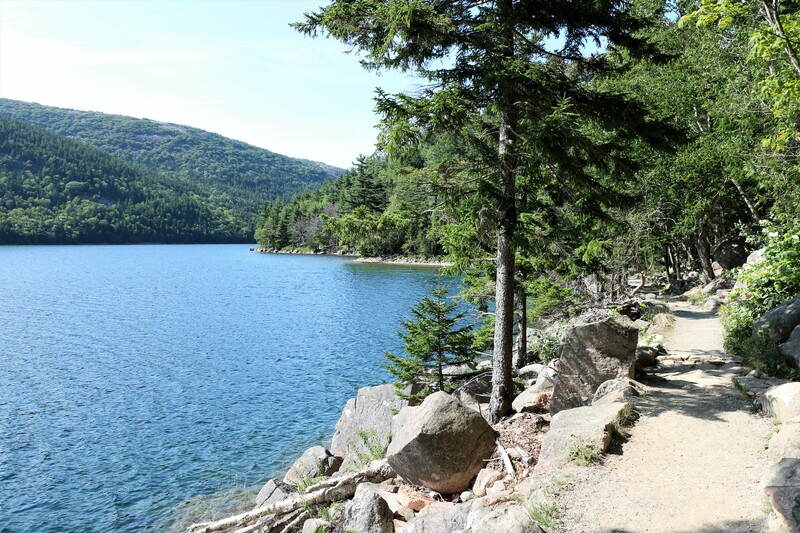 We really enjoyed this beautiful trail that follows the shore of Jordan Pond. Some of it was easy and the path was well marked. But some parts found us scrambling over rocks. There is also a boardwalk portion that goes over a bog through the forest. Of course we saw some people wearing flip flop like sandals but I was glad I had my hiking shoes on. The trail ends at a road held up by one of the Rockefeller Bridges . 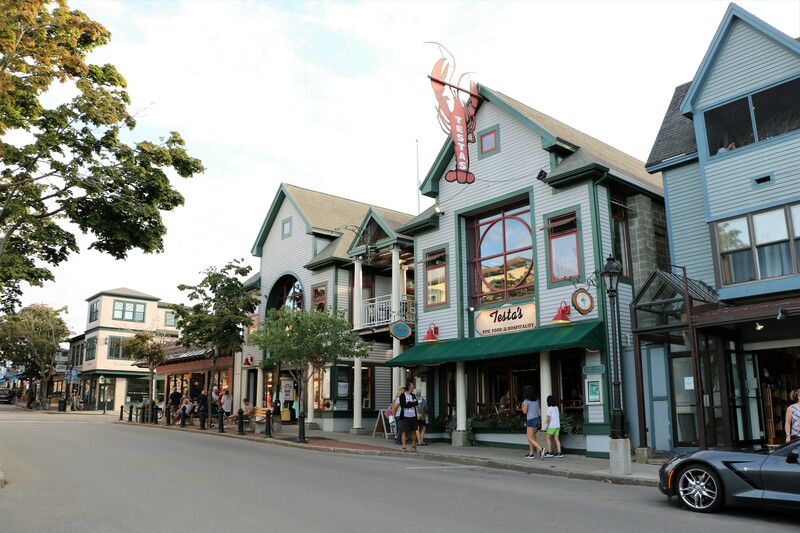 The town of Bar Harbor is cute and touristy. 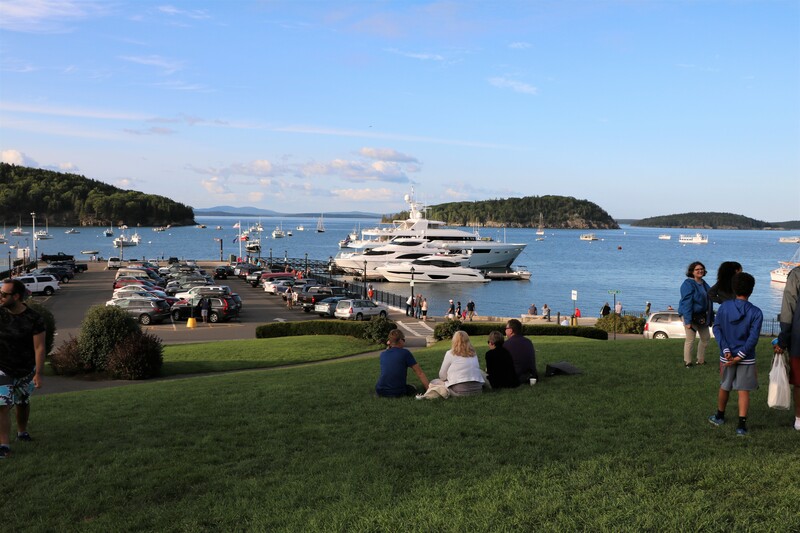 The town harbor has a nice park area and a great view. After our time at Acadia, we drove into Massachusetts, and parked the rig in a campground outside of Boston so we could fly home for a family wedding. After that we returned for the last third of our time in Maine. 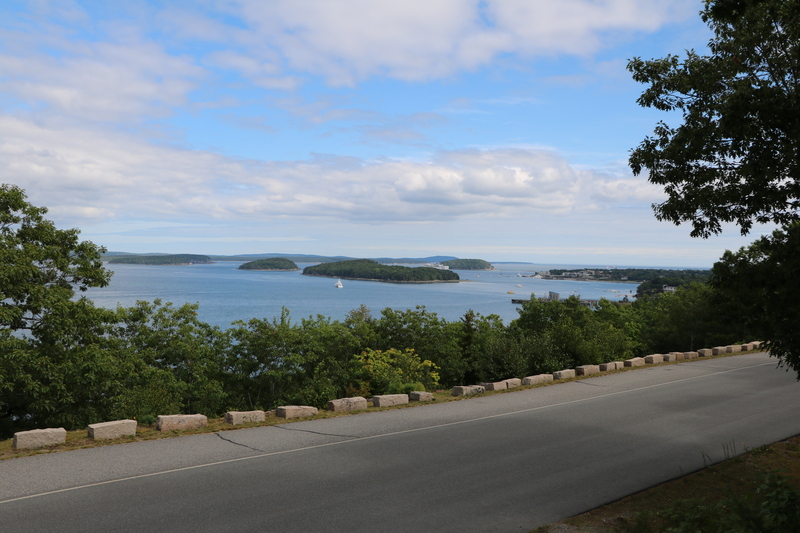 The last RV park we stayed at in Maine was the Shore Hills Campground in Boothbay Harbor. It had nice large sites. But before we ended up there we did park in the driveway of friends in Naples, Maine and stayed in a couple Walmart parking lots. 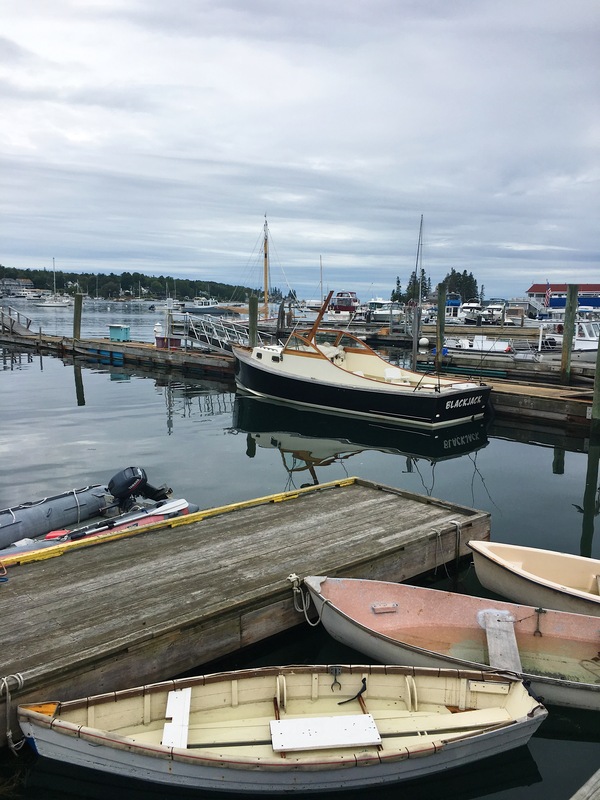 Naples, Maine is just a bit more than an hour northwest of Portland. 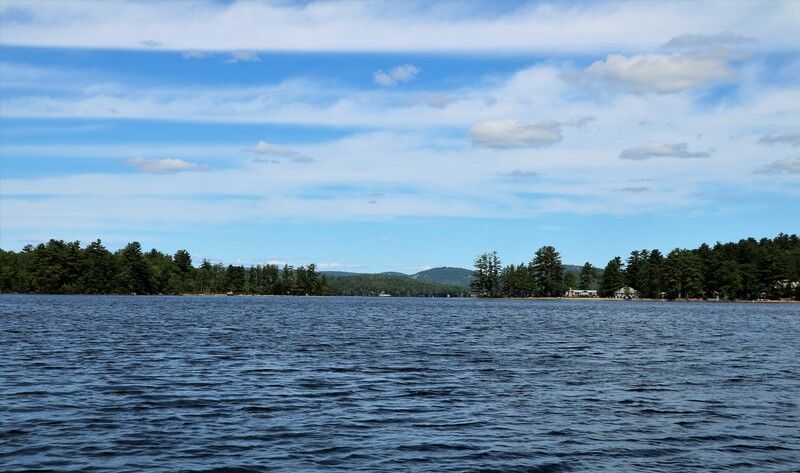 It’s a resort town known for three lakes: Long Lake, Brandy Pond, and Sebago Lake. Our friends treated us to a couple fabulous dinners which included lobster and clams at one and grilled steak at another. Plus, we took a wonderful day long boat ride across Brandy Pond and Long Lake. I was amazed at how similar it seemed to the Traverse City area lakes in Michigan. While we were in Naples, Roy and I took a day trip to Mt. Washington in nearby New Hampshire – only a couple hours away. 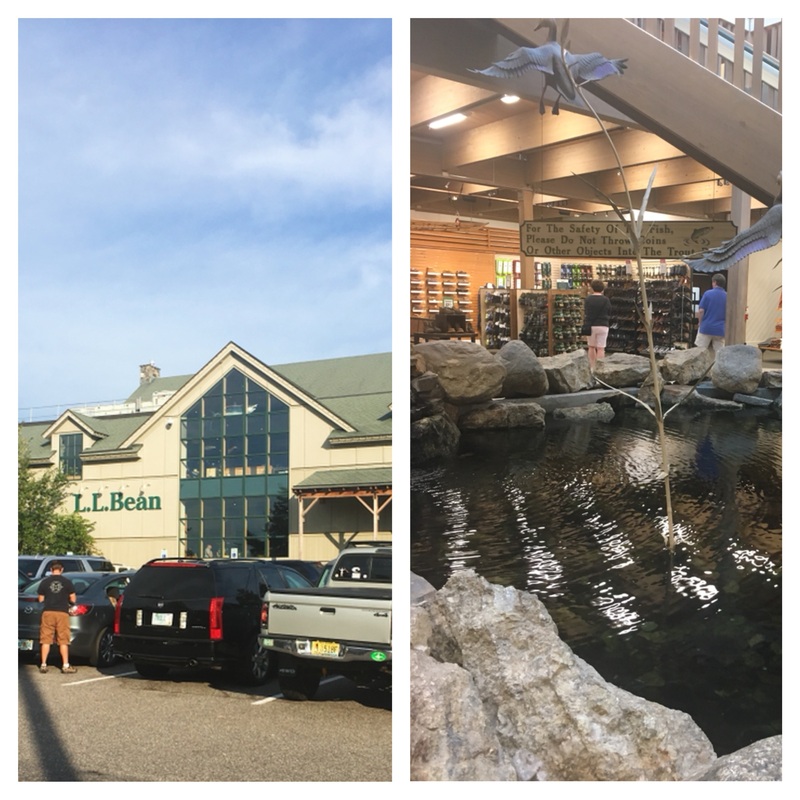 We had to make a stop in Freeport to visit Roy’s favorite catalog store, L.L. Bean. The flagship store takes up a whole city block and has not only a fish aquarium but a small fish pond as well. We didn’t go, but apparently there are several outlet stores close by such as Brooks Brothers and Ann Taylor Loft. Since Bon Appetit named Portland their 2018 Restaurant City of the Year, I talked Roy into driving there for breakfast one day. 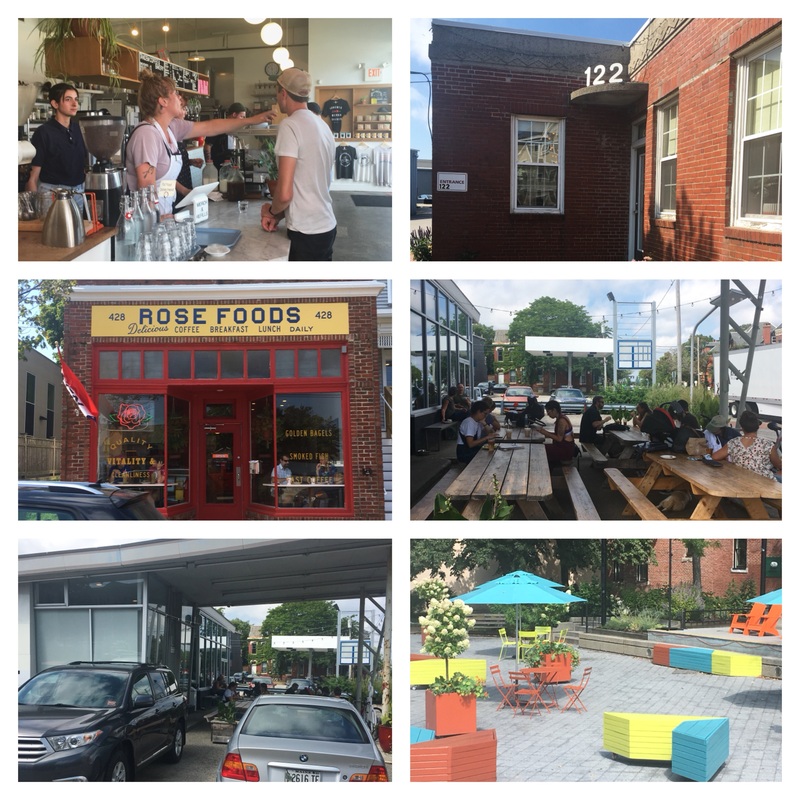 We visited the recommended Rose Foods and Tandem Coffee Bakery. Everything was incredibly delicious, but if you go, don’t forget your wallet! We happened to be there on a Wednesday, so we got to go to Portland’s weekly farmers market at Monument Square. 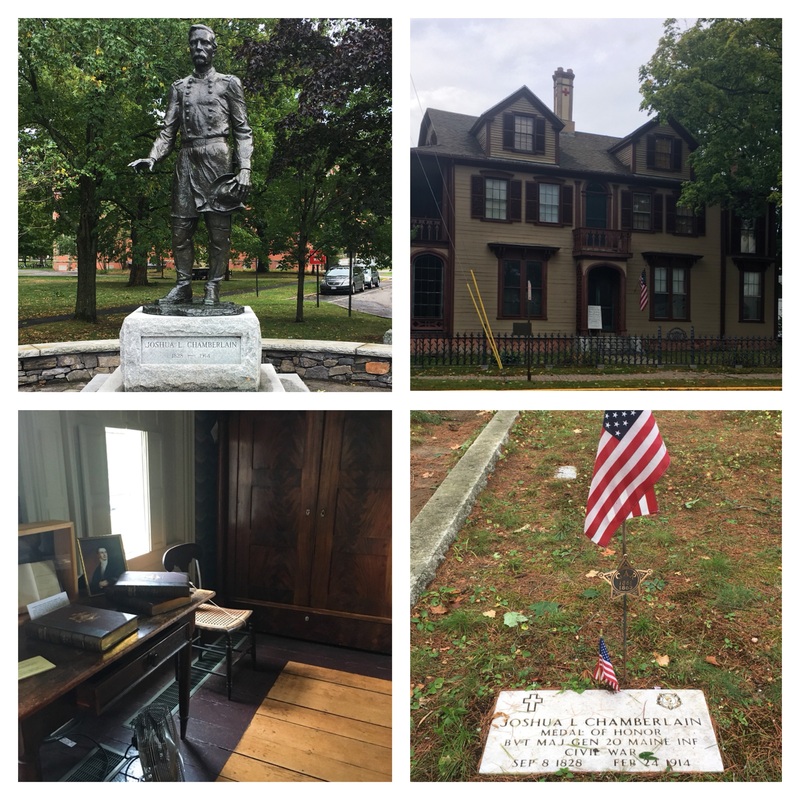 We took a day to go to the campus of Bowdoin College in Brunswick, Maine so we could go to the Joshua Lawrence Chamberlain House Museum. Chamberlain was a Civil War Hero, Governor of Maine, and President of Bowdoin College. He is best known for defending Little Round Top at Gettysburg and being at Appomattox for the surrender. 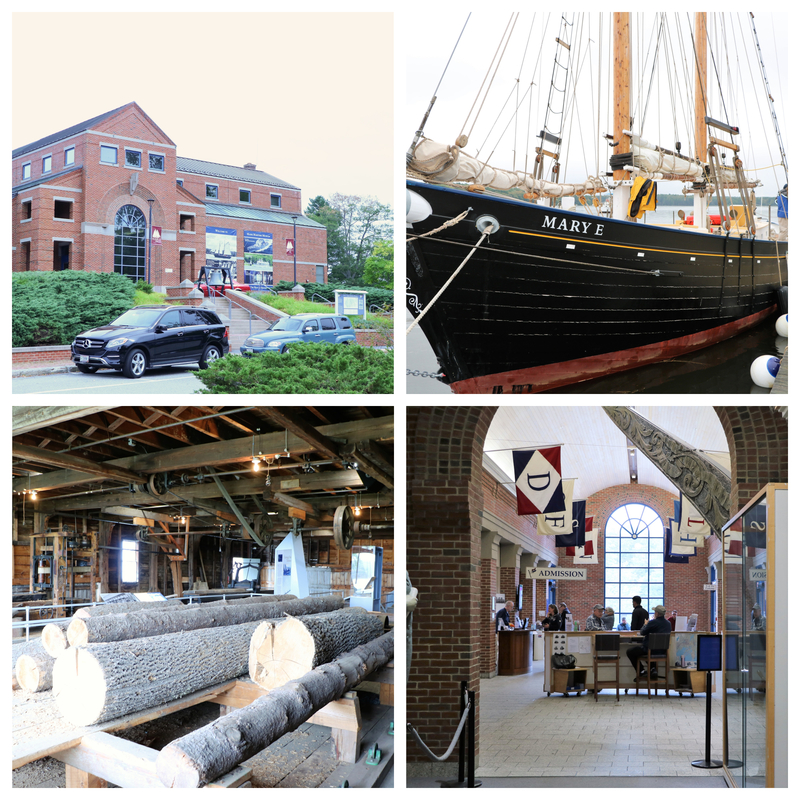 We spent a couple days going through the Maine Maritime Museum in Bath. The displays inside are very well done and the buildings outside are an actual restored shipyard that built wooden schooners. There is even the historic home of the shipyard owner to tour through. We came back the second day to take the Land and Sea Tour. First we took a trolley ride around the town and past the Bath Iron Works which is Maine’s fourth largest employer and currently has a Navy contract to build destroyers. There were lots of posted signs that taking photos was not allowed. 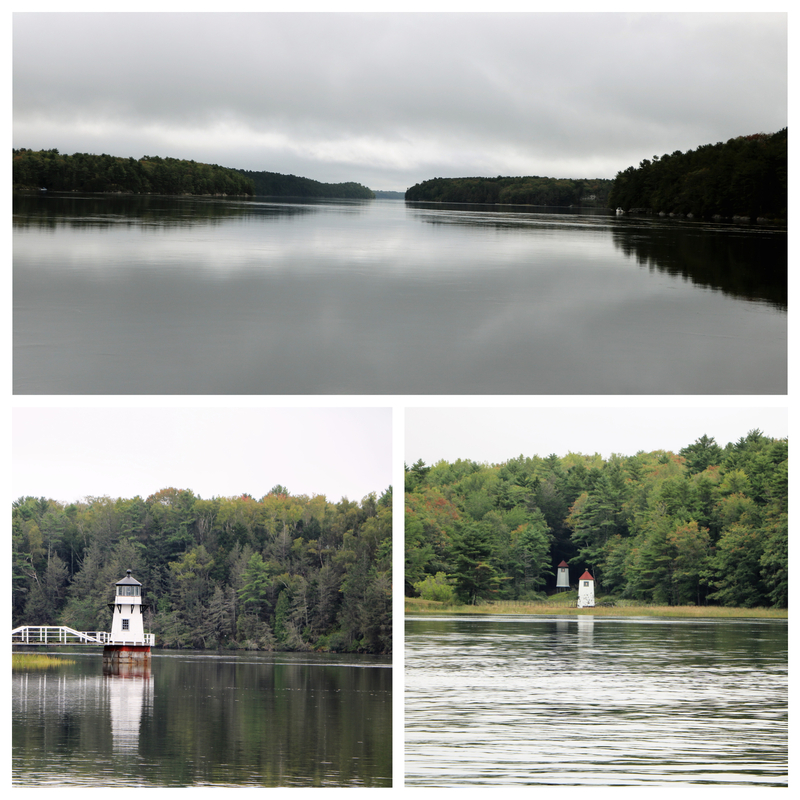 Then the second half of the tour was a boat ride that took us along the Kennebec River and past several light houses. The boat went as close to the water side of the Bath Iron Works as it was allowed to do. I did take one photo here, but as we got closer, I refrained. It’s hard to see, but on the far right of the pier is a stealth looking Zumwalt class destroyer. Heavily computerized, it only needs a crew of 130 and has plenty of warfare capability. The weather by the end of our time in Maine was over cast and rainy much of the time. 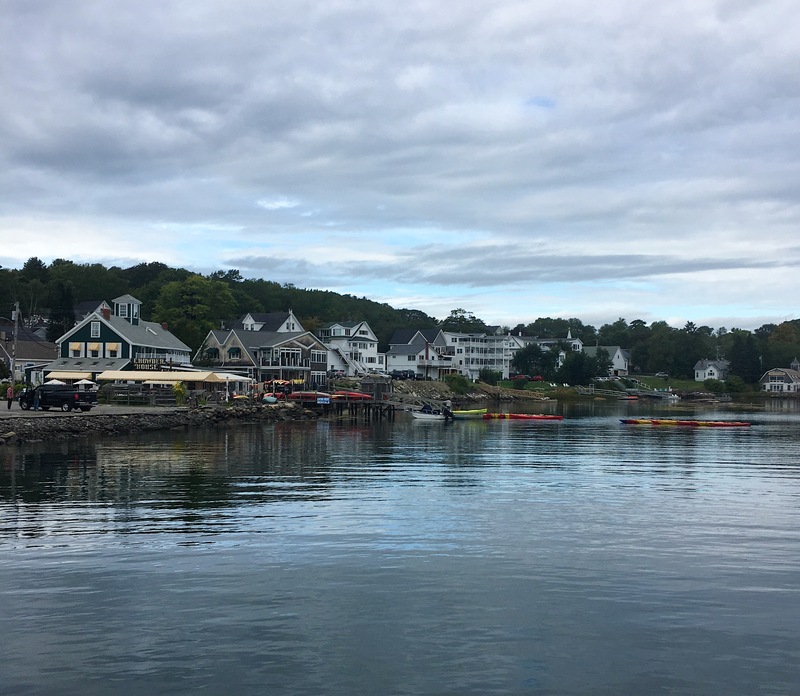 We still found Boothbay Harbor utterly charming! It has unique places to shop in its downtown area and lots of bed and breakfasts. Since we got there after Labor Day, things seemed to be buttoning up. 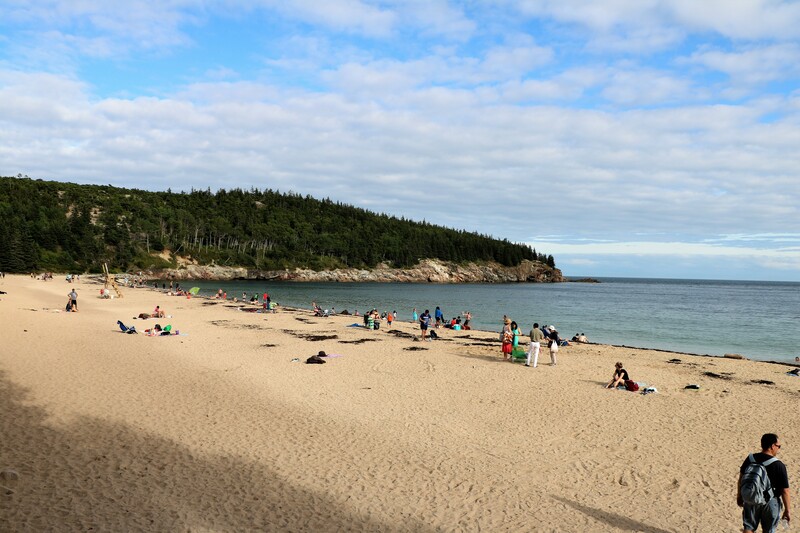 Lobster and clamming tours were over until next season. We definitely felt like it would be worth it to plan a return trip for next year.